It is amazing, when you love some ingredients, they keeping showing up every where you go! (clear indication of foodie going mad! lol!) These ingredients are like that "beautiful bag" which you saw in a store, pretended to ignore it for high price and then found every other person holding the same bag... which kept you restless..... until you bought one and hung on your shoulder :) Wow! that was imaginative! isn't it? To foodie people like you and I, our ingredients are those beautiful "bags" which may not be costly, but are priceless to us! Two such ingredient for me are: avocado and corn. 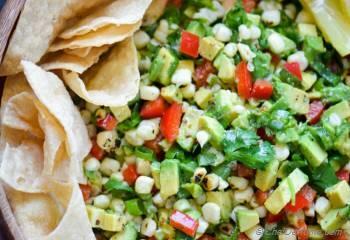 I get immediately interested to try something if that has good serving of corn and avocado! 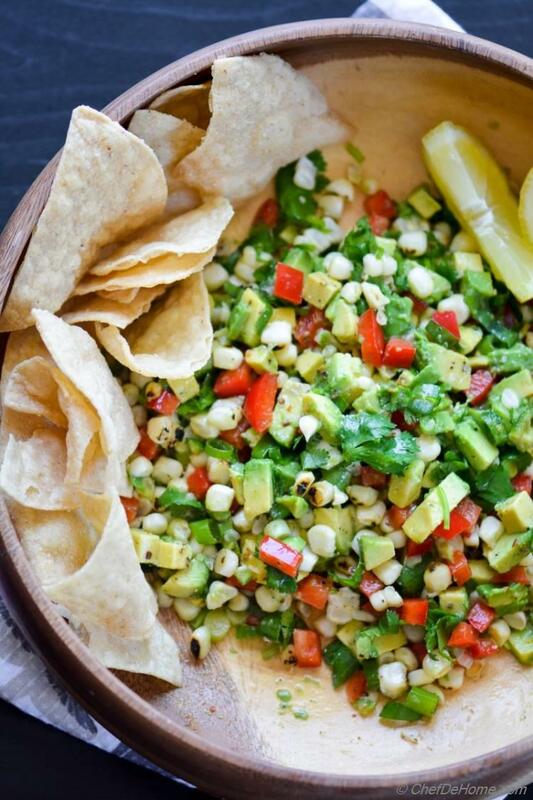 Needless to say, when sweetness of corn meets creamy avocado in a zesty salsa or guacamole, magic happens! and that splash of lemon is quintessential to this happy marriage! So far, one of my dearest avocado and corn combination has been Chilled Avocado Soup..... recently... this avocado and corn guacamole has made second dearest place in my heart! Mexican cuisine is not just my favorite for nothing! I'm a die-hard fan of delicious, zesty, sweet and creamy flavors put together in healthy amalgamation of flavors! And that my friend, I see, often in Mexican Cuisine. I'm sure you thinking what was my inspiration..... or in other words, where did I found my favorite "bag" this time ;) Well.... this happened the same place I got inspiration for Orange Adobo Margarita.... our very favorite CPK (California Pizza Kitchen). Since, we shifted our apartment, CPK is closest and when we are not planning to eat at home over the weekend, CPK has become our favorite place to be. I like the fact that they are open almost till midnight. So perfect for those late-night cravings (specially!) When I saw it first in their menu, I knew, I have to try it! 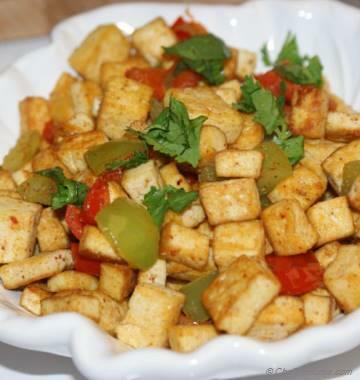 This recipe is inspired from CPK but is certainly not a copycat. First of all, CPK don't use "roasted" corn. Second, the guacamole, served in CPK also has black beans.... but I decided to skip some carbs from my version and kept it just all fresh veggies. I like the fact that without beans, this guac is also fit for Paleo Diet. However, feel free to add some cooked and rinsed black beans, to make portion size more substantial, if you prefer. You were wondering! Weren't you? If you like corn and avocados like I do, I'm certain you will like this simple and simply delicious guacamole. Include it in your next Menu for Tex-mex party or make a big bowlful for Cinco De Mayo get-together! Why? Because, there always room for "one more Guacamole" ;) Just don't forget to serve a bowl of chips on the side. Btw, chips will not be paleo. If serving for Paleo Party, serve veggie chips or lettuce leaves to make lettuce wraps. Oh! before I direct you to guacamole, this dip is Vegan and also gluten free. Total Time 15 minutes Prep Time 10 minutes Cook Time 5 minutes Difficulty Easy Yields 2.5 Cups Serves 6 Notes No. of servings depends on serving size! 1. 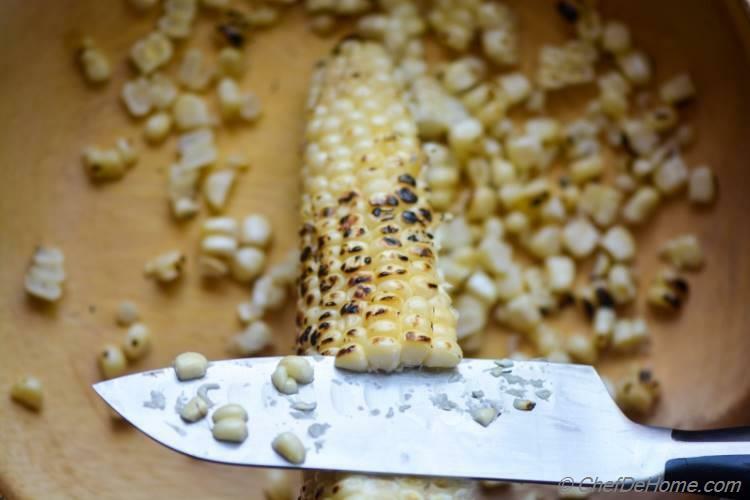 Roasted or grill corn on open flame until blistered and tender. Set aside to cool a bit, then run knife through kernels to remove kernels in a bowl. 2. Slice red bell pepper, scallions (green onions), serrano and add to the bowl with corn. 3. Add in small diced avocado, chopped cilantro. Top with lemon juice, salt, black pepper, and paprika. 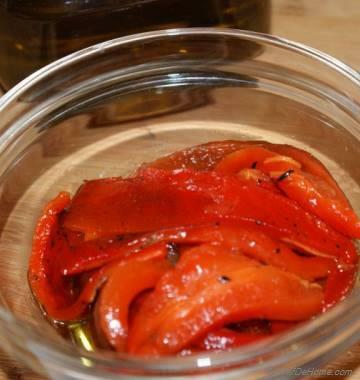 Mix well to combine and leave refrigerated for at-least 20 minutes for flavors to develop. 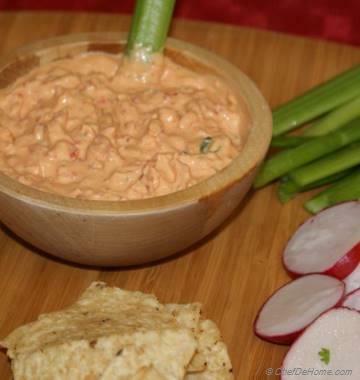 Serve with big bowl of tortilla chips. Enjoy! You can included some black beans on the side and lettuce leaves to make healthy and lite veggie tacos. To prevent browning of avocado, make sure to add lemon juice just when you slice avocado. Every picture tempting me to dive right in! This is irresistible Savita. They are my favourites too! Anupama, thanks! Glad you like these naans! what a great twist on guacamole. I love the addition of corn. thanks, Dannii! I'm glad you like it my friend! Guacamole with corn .....sounds interesting:) D? Nusrath, thanks a ton! Guacamole and corn are my favorite these days! Yummmm!! I can eat a big bowl of that right now, seriously too hard to resist especially with that roasted corn! Thanks, dear Anu! 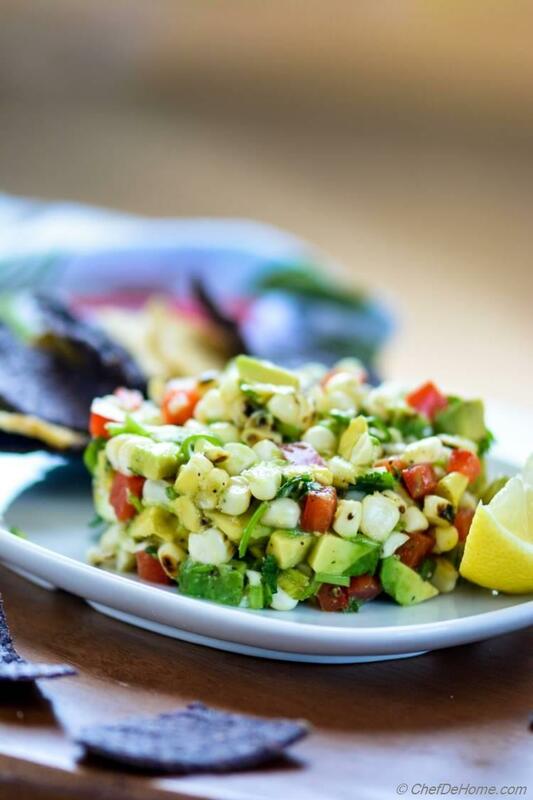 Roasted corn is sure hit with guacamole! 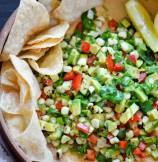 Bright pictures and delicious guacamole, perfect for summer! Love the addition of corn! I wish I had a bowl of this in front of me right now! :) Thanks, Mira! I wish I can send you this bowl right away! This guacamole looks just perfect! I love that you made it with corn! So creative and sounds so delicious! Yum! Corn in guacamole sounds absolutely amazing...and now that I think about it... guacamole shouldn't be without it! Welcome to the "club" my friend! 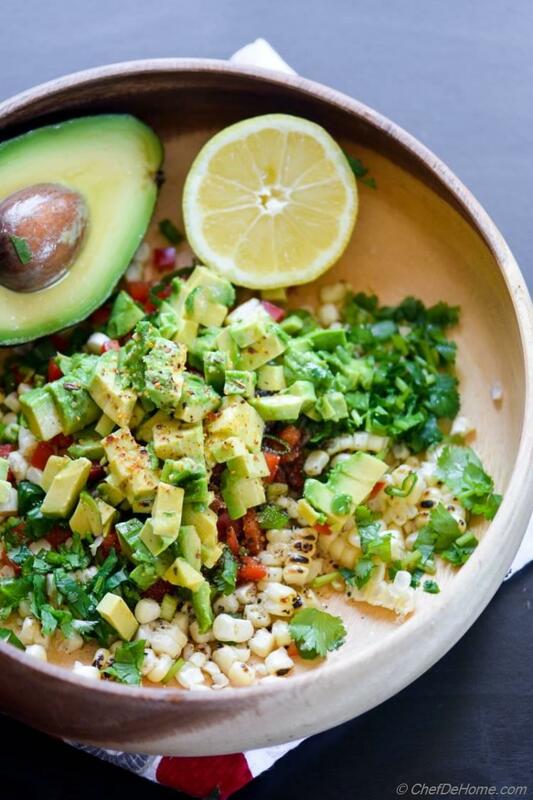 Corn and avocado are made for each other! :) thanks for stopping by! Padma, thanks! I'm glad you like my friend! 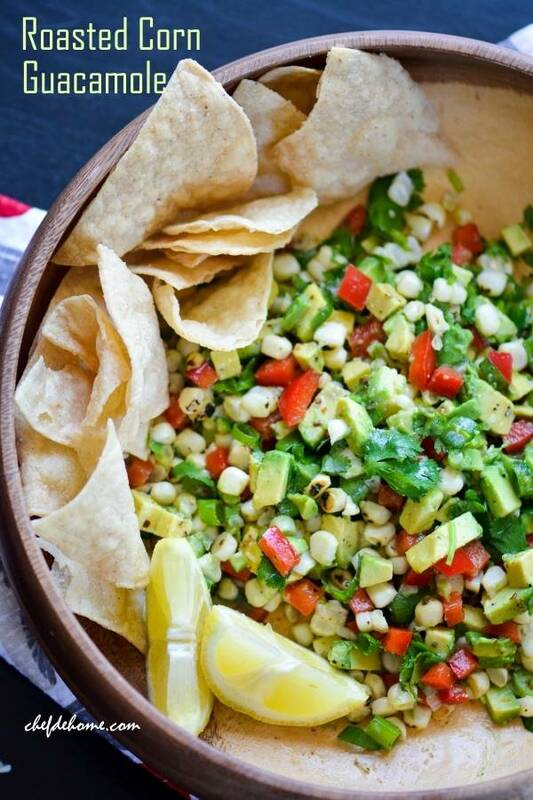 I love the idea of corn with guacamole. I've never had it that way... Can't wait to try it! Olivia, thanks! 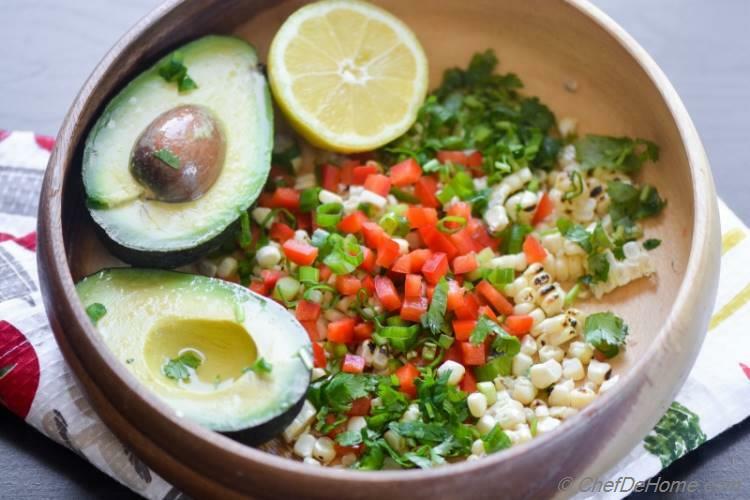 I'm sure you will love corn and avocado together!